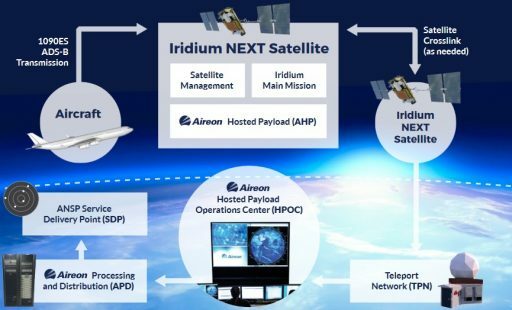 Iridium-NEXT is a low-orbiting communications satellite system operated by Iridium Communications Inc. as the company’s second generation global communications system for satellite calls and data transfer. Comprised of 66 active satellites in orbit, Iridium-NEXT delivers full global coverage on a 24/7 basis and, through a unique Public-Private Partnership – offers unprecedented access to Earth observation data by flying hosted payloads on each of the constellation spacecraft. Iridium is a Mobile Satellite Services provider, offering worldwide voice and data communications through satellite phones and other transceiver units with truly global coverage including the polar regions, the vast oceans and airways. The Iridium constellation was conceived in the late 1980s to improve communications at high Earth latitudes where services from Geostationary Satellites may not be available due to their low position in the sky. An early calculation showed that 77 satellites would be needed to achieve full global coverage and the project was named Iridium for the metal with atomic number 77 (with 77 electrons circling the nucleus, representative of the constellation around Earth). Development of the Iridium system – comprising the space segment and customer terminals – was handled by Motorola with Lockheed Martin contracted to build the satellites. The first five Iridium satellites launched in May 1997 and the full constellation of 66 active spacecraft and six spares was established in mid-May 1998 with services starting on November 1, 1998. Less than a year after the company’s services had gone live, Iridium SSC had to file for bankruptcy due to a combination of the initial cost of deploying the system and difficulty gaining customers because of cost of service, reception issues and mismanagement. After the company went bankrupt, a valuable asset – 66 active satellites circling the Earth – was up for sale and a private group of investors bought the constellation for under $50 million and services were re-started in 2001 under Iridium Satellite LLC. Seven new spares were launched by June 2002 and business took off with users flowing in from various sectors including maritime, aviation, government, different industries, frequent world travelers and explorers. There have also been space-based applications for Iridium in the form of inter-satellite link experiments using small satellite missions and the Re-Entry Break-Up Recorder flown on various re-entering spacecraft also employs Iridium to send data to its operators. In September 2009, the company merged with GHQ, a special purpose acquisition company, to form Iridium Communications, Inc. By that point, the satellite constellation was without spare satellites in some of its planes and satellites were shifted between planes to maximize coverage. As of mid-2016, only 64 satellites were operational, creating service outages around the equatorial region where the satellite footprints are most spread-out with very little overlap between satellites. The plan for replenishing the Iridium constellation was announced in 2007 to ensure continuity of the existing architecture but expand capacity, support higher data rates, and introduce new services while being more cost-effective when it comes to maintenance and standard operations. 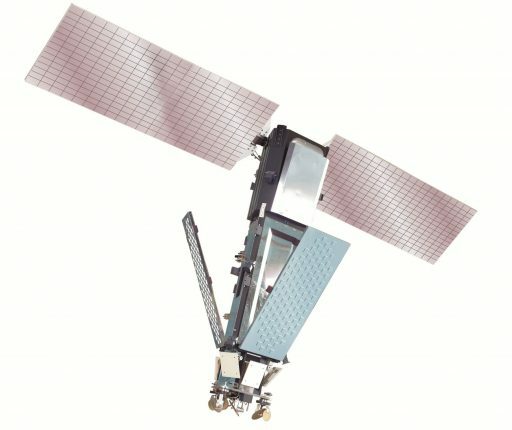 Iridium-NEXT is also the first commercial satellite constellation made available for hosted payloads to provide a unique opportunity for meeting Earth observation requirements that could not be realized by a stand-alone project. The Iridium-NEXT satellites have a projected mission life of at least 15 years, ensuring services will be extended to 2030 and beyond with risk mitigation through placing six spares in orbit in addition to the 66 active constellation satellites and maintaining nine spares on the ground to be launched when new spares are required. 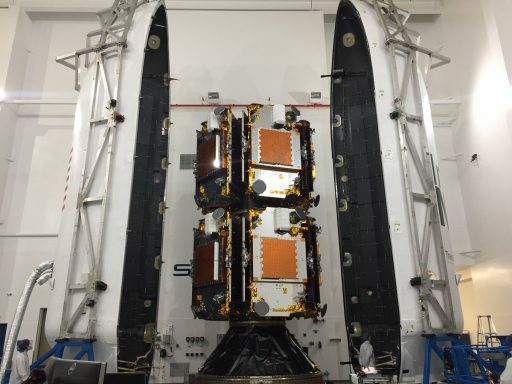 Built by Thales Alenia Space and assembled by Orbital ATK, the primary satellites of the Iridium-NEXT constellation will launch atop seven SpaceX Falcon 9 rockets, lifting off from Space Launch Complex 4E at Vandenberg Air Force Base to reach the desired 86.4-degree orbit where six planes will be established, each with 11 satellites. Thales Alenia was selected over Lockheed Martin in the final around of procurement reviews and received a $2.1 billion contract in 2010 with an additional $800 million allocated for launch services and ground system upgrades. 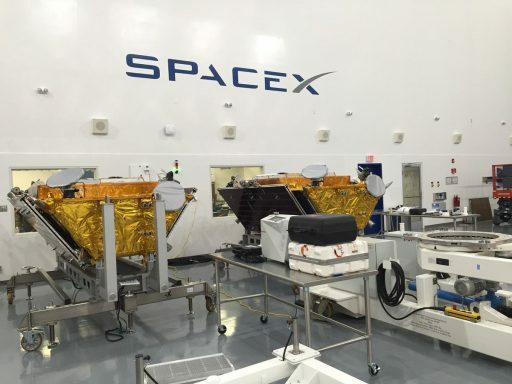 The Iridium-NEXT satellites connect to mobile and Iridium OpenPort terminals through L-Band at data speeds of up to 128kbit/s and 1.5Mbit/s, respectively, while a high-speed Ka-Band service at up to 8Mbit/s will be available for larger fixed and transportable terminals. 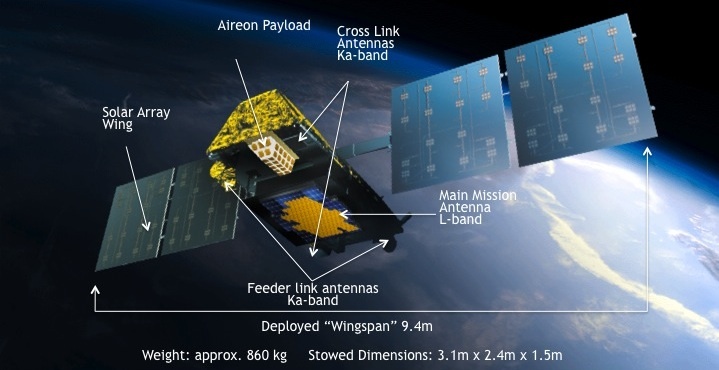 Each satellite then connects to up to four constellation members via a Ka-Band inter-satellite link – two neighboring satellites in front and behind within the same orbital plane and two satellites in neighboring planes to either side to route the information to and from its destination. 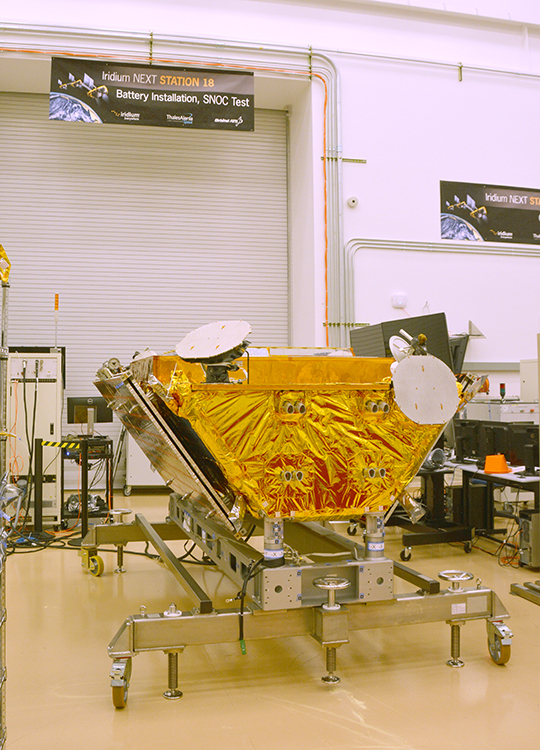 The hosted payloads program on the Iridium-NEXT satellites provides an unmatched opportunity for Earth observation missions aiming for global coverage and rapid revisit time. Placing a hosted payload on a satellite comes at a fraction of the cost of designing, building and launching dedicated space-based platforms which, in many cases, is responsible for projects not leaving the drawing board. The Iridium-NEXT satellites are based on Thales Alenia’s ELiTeBus-1000 (Extended LifeTime Bus) satellite platform, each weighing 860 Kilograms at launch and measuring 3.1 by 2.4 by 1.5 meters in size in its stowed configuration. ELiTeBus has been utilized for the Globalstar second generation communications satellites and the O3b internet satellites that serve developing countries from an equatorial orbit. The Iridium-NEXT satellites have been designed for an operational life of 12.5 years with a stretch goal of 15 years, holding sufficient propellants to support an extended mission. ELiTeBus provides a flight-proven solution with extensive flight heritage in all major system components. The platform has a mass of around 450 Kilograms and can facilitate payloads of 300kg or more. The satellite bus is trapezoidal in shape, consisting of rigid aluminum honeycomb panels that build the structural backbone of the satellite and support all subsystem components. The spacecraft bus provides all necessary resources to the payload including pointing stability, propulsion capability, a stable power supply and data connections. Payload systems are accommodated on the 3 by 1.5-meter Earth-pointed panel normally in a nadir-facing orientation during nominal flight phases. The spacecraft features two deployable two-segment solar arrays for power generation via gallium-arsenide solar cells, dedicated electronics are used for power distribution and Li-Ion batteries for power storage. The solar arrays are capable of automatic sun-tracking to increase exposure and optimize power generation during the sunlit portion of the orbit. The electrical power system delivers an average power of 2,200 Watts, using a 28-Volt power bus for distribution to the various loads on the satellite. The satellite platform is three-axis stabilized with precise pointing capability using position data provided by Star Trackers, Earth & Sun Sensors and an inertial measurement unit. A GPS unit provides orbit position information to allow the calculation of pass geometry over the various ground terminals. Stabilization and attitude actuation is accomplished using a combination of reaction wheels and torque rods for momentum management. The primary attitude determination system of the Iridium-NEXT satellites is an AA-STR Star Tracker System provided by Selex Galileo. A Star Tracker operates by collecting images of the star-filled sky and processing them through a catalog of known star constellations to calculate the precise three-axis orientation in space. The AA-STR is an autonomous star tracker system meaning that all processing is completed within the star tracker assembly and the system delivers complete attitude quaternions to the spacecraft computer to then process it as part of the attitude determination algorithm. Each AA-STR weighs 2.6 Kilograms and is 16 by 16 by 35 centimeters in size with a field of view of 20 x 20 degrees. The star tracker can track up to 15 stars simultaneously and can tolerate body rates up to two degrees per second – requiring the satellite to be de-tumbled by means of the Inertial Measurement Unit and attitude actuators before the STR can acquire data. The baseline ELiTeBus hosts a Hydrazine monopropellant propulsion system with a propellant load of 141 Kilograms, feeding eight 1-Newton thrusters for orbit adjustments and constellation maintenance as well as assistance in attitude control during safe modes. The ELiTe bus is equipped with an onboard computer centered around a LEON3 microprocessor which is widely used in space applications. The OBC system provides command and control of all subsystems of the satellite platform and commands payload operations. A 1553B Data Bus is used aboard the satellite, connecting all systems to the computer and also interfacing with the platform’s communication system. 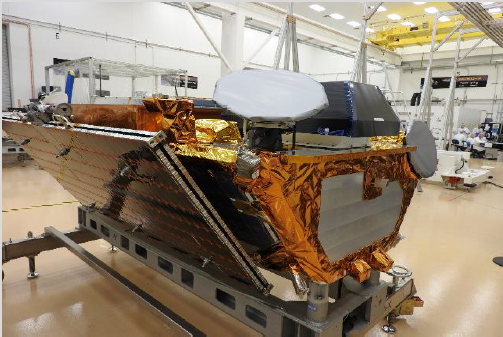 The heart of the Iridium-NEXT communications terminal is an L-Band phased array antenna installed on the spacecraft’s Earth-facing panel and generating 48 transmit/receive beams for communication with user terminals. Communications with users is completed in a Time-Division Duplex (TDD) architecture which separates the uplink from the downlink by the allocation of different time slots in the same frequency band – an advantageous feature as it allows for dynamic adjustment of time slots depending on the current demand for up/downlink. 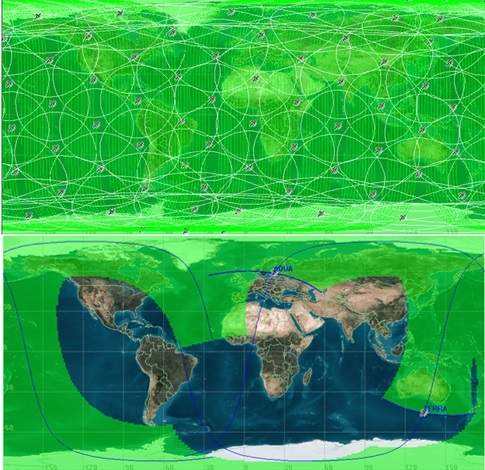 The phased array antenna creates a 4,700-Kilometer footprint area on Earth with a cellular pattern from where communications with a particular satellite is possible. 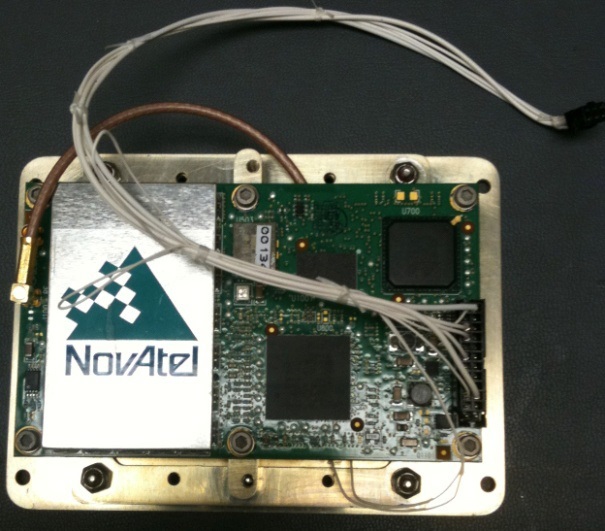 Each antenna consists of a dedicated antenna control unit inside the spacecraft body, a beamforming network, and 168 transmit and receive modules. The communications payload is largely based on Software-defined technology, giving it the utmost flexibility to respond to changing demands and support a variety of services. The link between the Iridium satellite and a user typically operates at a 2.4kbps data rate for voice communications, up to 64kbps for L-Band Handset Data Services & Short Burst Data, and 512kbit/s to 1.5Mbit/s when using an Iridium OpenPort Terminal servicing customers with a need for more data. The L-Band up and downlinks operate from 1616 to 1626.5 MHz. 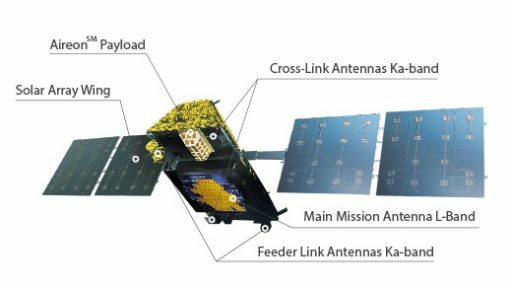 In addition to these L-Band services, the NEXT generation of satellites supports Ka-Band portable and transportable services reaching data rates up to 8Mbit/s. Each Iridium-NEXT satellite is outfitted with two 20/30GHz (uplink/downlink) steerable feeder links connecting the satellite to a terrestrial gateway and four 23.18 to 23.38 GHz crosslinks to connect each satellite to neighboring spacecraft in front and behind within the same orbital plane and two satellites in neighboring planes to route data to their respective destinations. Cross-link communications occur at a data rate of 12.5Mpbs, half duplex and are realized via two fixed antennas for in-plane relay and steerable antennas to remain locked on satellites in neighboring planes. Telemetry and commanding of the satellites occurs through 20/30GHz links via omni-antennas on the satellite that operate in all spacecraft orientations. The Iridium-NEXT constellation is identical in architecture to the original system with 66 active satellites in six orbital planes, orbiting in circular orbits at 780 Kilometers in altitude and at an inclination of 86.4 degrees which allows for global coverage. The orbital period is 100.5 minutes. 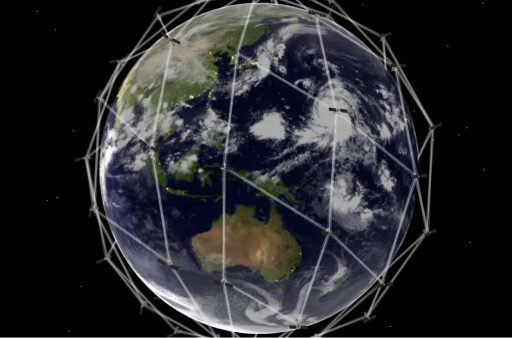 The constellation has been set up to provide sufficient overlap between individual satellites to ensure full global coverage at all times of day. Naturally, overlap is greatest in the polar regions and the satellites are furthest apart when passing over the equator. Except for planes 1 and 6, the orbital planes are co-rotating at a spacing of 31.6 degrees. The first and last are spaced 22° and form a seam where the satellites are counter-rotating. The entire constellation is capable of supporting 3,168 communications spot beams, however global coverage only requires 2,150 simultaneous beams. The satellites typically control their orbital altitudes to within ten meters to maintain their precise position within the constellation. Position errors are not allowed to grow over 15 Kilometers and the typical position knowledge for each satellite is better than 2.2 Kilometers. The Iridium-NEXT constellation is the first commercial satellite system offering spaces on each constellation member for hosted payloads in a Public-Private Partnership arrangement – enabling a large infrastructure of Earth-monitoring payloads to be established at minimum cost. 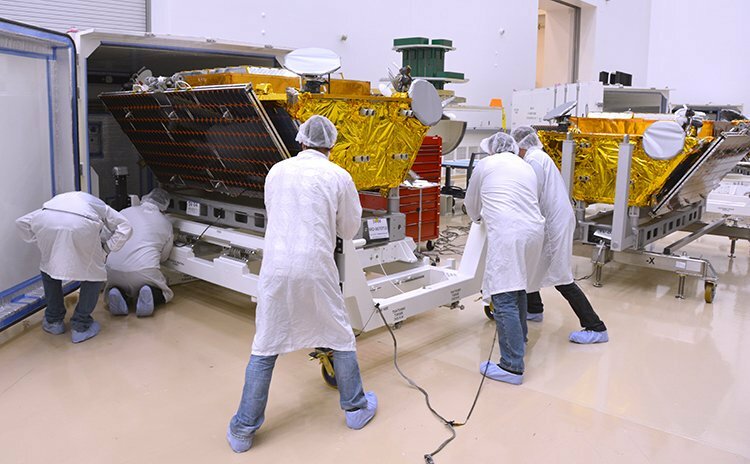 Each satellite can accommodate a hosted payload of 54 Kilograms, offering an envelope of 30 x 40 x 70 centimeters and an average power supply of 90 Watts (200W peak), plus data connectivity through the main spacecraft at up to 1Mbps (100kbit/s average). The Iridium hosted payload program has been designed for a variety of sensors such as atmospheric monitors, altimeters for monitoring of sea surface, waves & ice, radiometers for a global measurement of Earth’s radiation budget, multispectral imagers for environmental monitoring, fire detection systems, specific sensors for observation of polar ice or cloud motion vectors. 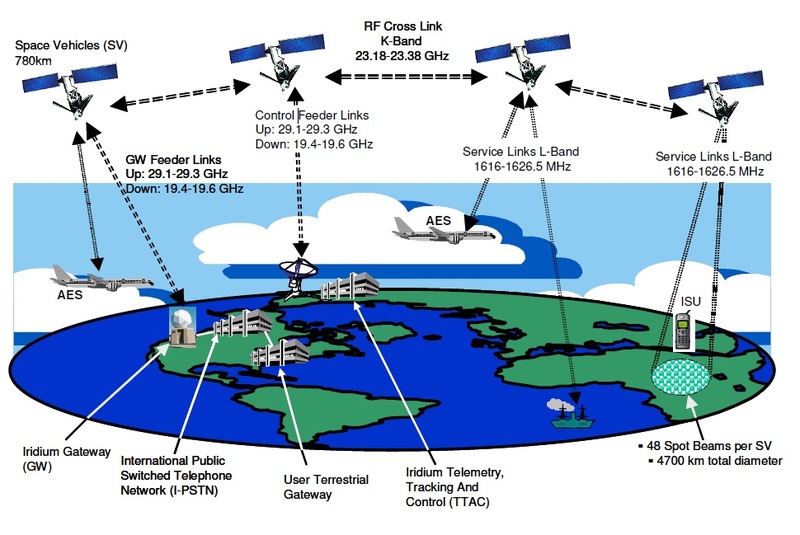 Data from the hosted payloads is made available to operators in near-real time, traveling along the global net of inter-satellite links before arriving on a ground-based gateway from where the data is relayed to the instrument operators via terrestrial networks like the Internet. 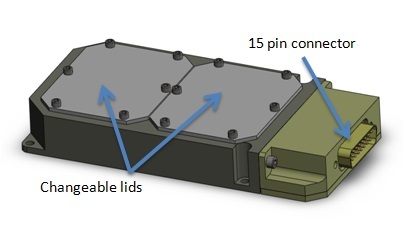 To realize a maximum of opportunities for hosted payload operators, Iridium developed the SensorPOD concept – allocating virtual containers with specific dimensions to make spaces available to small payloads and payload suites. 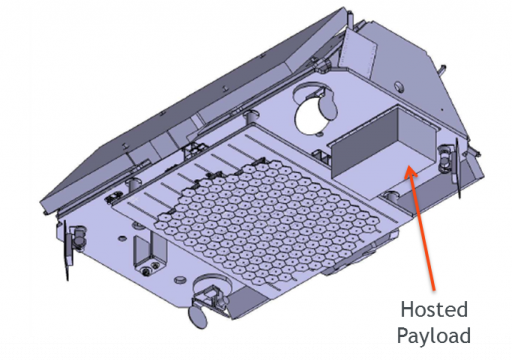 Payload volumes on the satellites are available in the Earth-facing and Ram directions. Iridium, through its joint venture Aireon LLC, deploys ADS-B receivers on all Iridium-NEXT constellation members to establish a global, real-time aircraft surveillance capability for ANSP (Air Navigation Service Providers) through the Automatic Dependent Surveillance-Broadcast signals sent by every commercial aircraft. 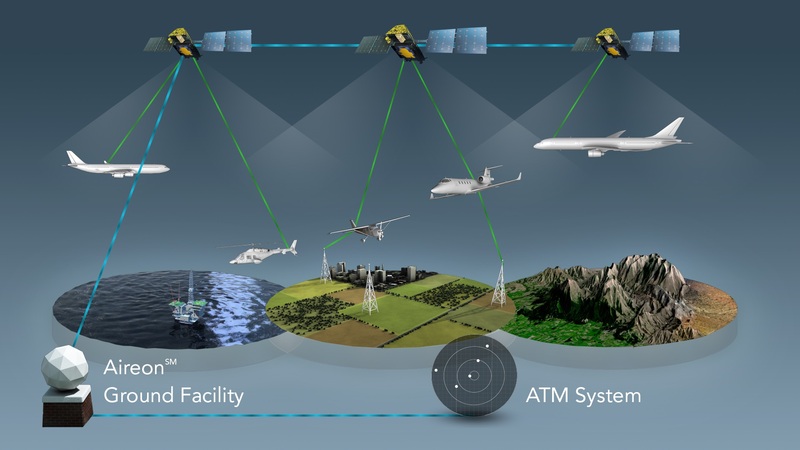 ADS-B represents periodic transmissions of data by an aircraft’s Mode-S transponder at the 1090MHz frequency, containing the aircraft ID, its position, altitude and intent. These signals are used by air traffic control for areas in which a ground receiving architecture is present, but given the short range of the ADS-B signals, they are not useful over land areas with poor infrastructure and oceanic coverage is very limited. Nevertheless, ADS-B has become a significant part of air traffic control, being used in the same manner as information provided by radars. ADS-B will become mandatory for all aircraft in the near future and there is a strong desire to ultimately phase out the traditional radars and purely rely on ADS-B since the receivers are much easier to maintain. Previous spaceborne ADS-B receivers have shown that the signals can be received without trouble by low-orbiting spacecraft, clearing the way for operational application of the system to realize a global aeronautical monitoring capability, closing gaps in terrestrial radar and radio coverage which is considered of utmost importance after incidents such as Flight MH370. Aireon LLC, headquartered in McLean, VA, is a joint venture between satellite operator Iridium and NAV CANADA with support from the U.S. FAA (Federal Aviation Administration) and Harris Corporation as hardware supplier. The prime objective of Aireon is to take advantage of the global setup of the Iridium-NEXT constellation to collect aeronautical surveillance data across the globe and deliver it in real time to Air Navigation Service Providers around the world as well as commercial airline customers wishing to track their fleets via ADS-B. ADS-B, once fully integrated in operational Air Traffic Control, will bring a number of improvements in air traffic to increase efficiency by offering aircraft more flexible, fuel-saving routes through airspace – possible by reducing spacing requirements in place for procedural traffic control. ADS-B delivers accurate position records with integrity to air traffic control every second, allowing separation minima to be reduced which in turn enables more aircraft to follow the most efficient flight trajectory. 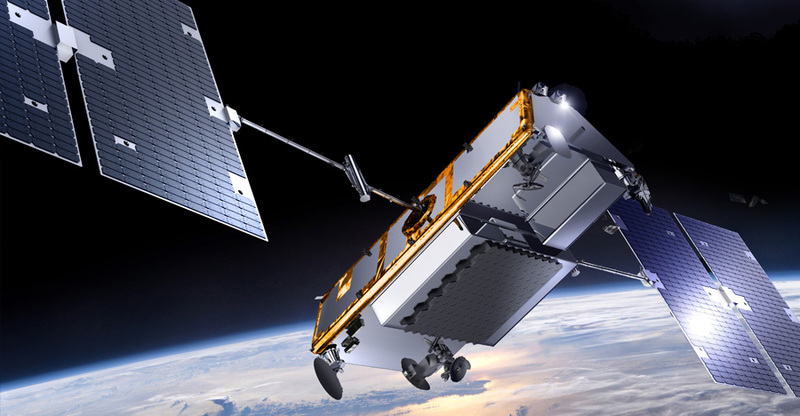 Harris Corporation built 81 ADS-B 1090 Extended Squitter receiver payloads for the Iridium NEXT satellites – compact & low-power receiving electronics occupying only a small volume within the satellite’s hosted payload accommodations. Tracking over 10,000 aircraft at any given time, the system will deliver data to air traffic control centers with a latency of under 1.5 seconds at an update rate of under eight seconds. 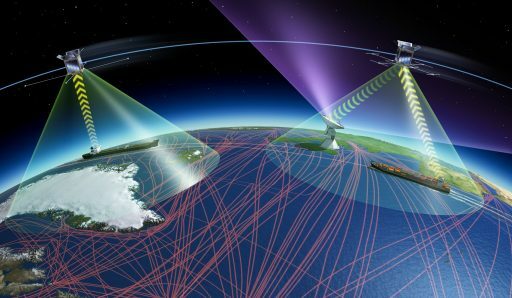 In addition to global aircraft tracking, the Iridium-NEXT constellation is also perfectly suited for ship tracking on a global scale via the Automatic Identification System which, over recent years, has also been introduced to operational space missions. The Automatic Identification System is used by sea vessels that send and receive VHF messages containing identification, position, course and speed information to allow the monitoring of vessel movements and collision avoidance as well as alerting in the event of sudden speed changes. These signals can be transmitted from ship-to-ship and ship-to-shore to allow the monitoring of a local area, but deploying space-based AIS terminals allows a broad coverage and data relay to ground stations for monitoring of large sea areas. 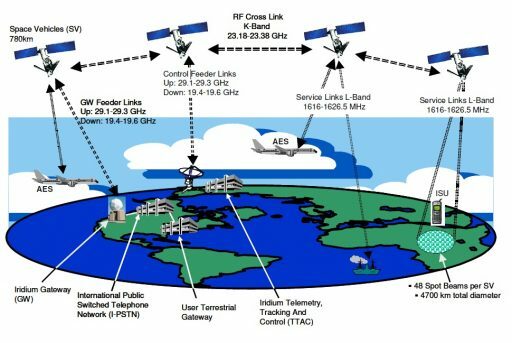 However, due to the large footprint of satellites, overlapping and signal collisions become a problem, especially for frequented traffic routes – requiring sophisticated receiving electronics to separate potentially overlapping signals. The AIS System deployed on the Iridium-NEXT constellation is operated by Harris Corp. and exactEarth Ltd. that entered a strategic alliance taking advantage of hosted payload & radio systems knowledge by Harris and exactEarth’s patented signal de-collision detection technology for global AIS tracking. Deployed on Iridium-NEXT, the AIS terminals will, for the first time, provide constant, real-time and global coverage – enabling customers to reliably track the location of vessels. The AIS terminal is based on Harris’ AppSTAR reconfigurable payload technology and delivers AIS data to customers at a latency of less than one minute, taking advantage of Iridium’s inter-satellite network to route data to the central gateway from where terrestrial networks are used for data distribution. GEOScan is a light-weight sensor suite installed on the Iridium-NEXT constellation to obtain data for environmental monitoring and climate science through a variety of sensors. The project takes advantage of the once-in-a-generation opportunity presented by Iridium and deploys a global constellation of sensor payloads that captures data to benefit a large cross section of the scientific community working in Earth and Space Science. Hosted payloads on the Iridium-NEXT constellation can take advantage of that constellation’s coverage to obtain revolutionary, massively dense global geoscience observations and tackle problems that require simultaneous multi-point observations all across the globe. GEOScan was brought on its way by a consortium of more than 100 volunteer scientists and engineers led by the Johns Hopkins University / Applied Physics Laboratory. The scientific opportunities opened up by Iridium were unique in that truly global coverage could be achieved while costs could be kept down because sensors could be based on off-the-shelf components and a massive effort to gather the information from the sensors could be eliminated through the use of Iridium’s existing infrastructure. The future of geoscience, according to the current consensus among scientists, lies in global and continuous coverage of key measurements – looking at the Earth as a whole, interactive system instead of collecting isolated observations of natural phenomena. 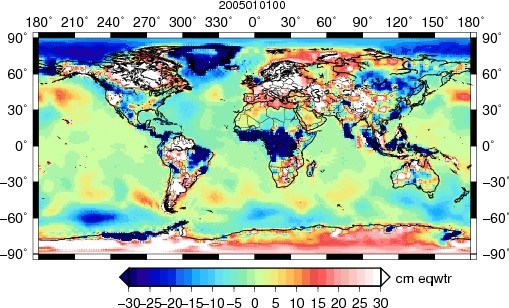 Specific objectives of GEOScan are to measure Earth’s outgoing radiation budget on a global scale at a temporal and spatial resolution necessary for studying the relationship between Earth’s outgoing infrared radiation and rapidly-evolving phenomena such as clouds, dust storms and volcanic activity as well as their effect on long-term climate. GEOScan measures the variations of global mass flux at an appropriate temporal and spatial resolution to uncover trends in Earth’s water cycle, cryosphere and climate. A space environment sensor is responsible for measuring Earth’s radiation belts and plasma environment with an unprecedented coverage to provide new insights into processes for large-scale global reconfigurations that drive space weather phenomena. 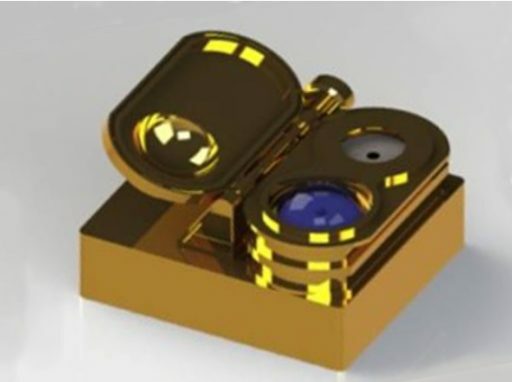 The GEOScan system has been conceptualized to minimize cost and be easy to manufacture in bulk as over 60 units are being deployed on the Iridium constellation. The GEOScan assembly is relatively compact, measuring only 20 x 20 x 14 centimeters in size and weighing 5 Kilograms. It requires an average power of 5 Watts (peaking at 10W) and generates data at 10kbit/s (average) to 100kbit/s (peak). CTECS (Compact Total Electron Content Sensors) make use of GPS occultation measurements to deliver data on the state of Earth’s plasmasphere and ionosphere in the form of Total Electron Content, electron density profiles and ionospheric scintillation measurements. GEOScan’s 66 detector systems provide an unprecedented, continuous global snapshot, for the first time revealing the temporal and spatial evolution of the ionosphere/plasmasphere from 80 to 20,000 Kilometers in altitude. Overall, the system achieves a temporal resolution of five minutes and a height resolution of ten Kilometers. Typically, CTECS monitors 10 to 15 signals from the GPS constellation for up to 15 simultaneous Total Electron Measurements per Iridium satellite. Taking data from all satellites allows for a complete tomographic image of the plasmasphere to be obtained at all times of day, opening a whole new way of nowcasting space weather events. The entire constellation sees around 1,000 GPS occultations in a 5-minute period which, when combined with over 4,000 ground-based sites can yield ionospheric maps at a horizontal resolution better than 100 Kilometers. Additionally, CTECS can contribute to gravity science when its data is combined with ancillary data such as satellite trajectory information and accelerometer data showing non-gravitational influences. In essence, the positions and velocities measured through GPS can be differentiated to reveal accelerations caused by gravitational features on Earth which – when calibrated properly – can reveal dynamic mass transport processes occurring on Earth’s surface and in the atmosphere. The CTECS sensor is a GPS receiver optimized to make Total Electron Content measurements, determine electron density altitude profiles and ionospheric scintillation measurements. CTECS tracks the L1 and L2 GPS signals as the Earth moves between the line of sight between the sensor and GPS satellite to obtain vertical profiles. 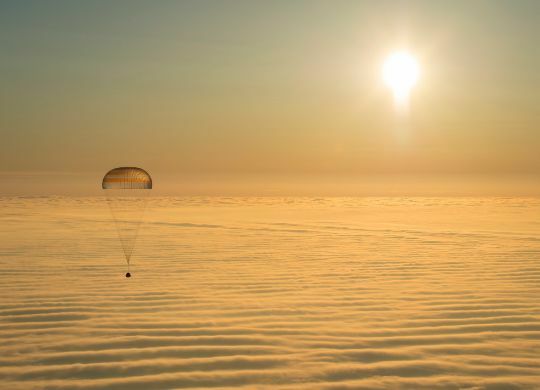 The system comprises a custom-made antenna system, low-noise amplifying electronics and a NovAtel OEMV-2 GPS receiver. Overall, CTECS weighs less than 200 grams and delivers a maximum of 62MB of data per day. The GEOScan Radiometer measures Earth’s outgoing radiation simultaneously on a global scale by employing two-channel radiometer systems. The cavity radiometers consist of an instrument tube with a front window through which radiation enters the instrument and is directed onto an absorber. Internal heaters keep the cavities at constant temperatures, measured by sensors in the material and heater currents are recorded to determine the incident energy since the currents required to keep the elements at constant temperature drop with increased heat flux. Both radiometers have a 127-degree field of view to generate a global view of Earth’s Total Outgoing Radiation every two hours with an accuracy better than 0.15%. One channel covers a wavelength range of 0.2 µm to 200 µm stretching from UV to the far infrared to measure the total radiant power incident from the Earth-direction. A solar channel, 0.2 µm to 5 µm measures the reflected solar irradiance in the UV, Visible and Near Infrared range. The radiometers have been calibrated to a precision of 0.09 Wm-2 with an accuracy of 0.3 Wm-2. Overall, the radiometer unit is 10 x 9 x 10 centimeters in size and weighs 0.7 Kilograms, drawing an average power of 0.3 Watts and generating 64bit/s of data. A protective cover over the cavities is opened after the satellites are launched to prevent foreign objects entering the instruments during ascent. 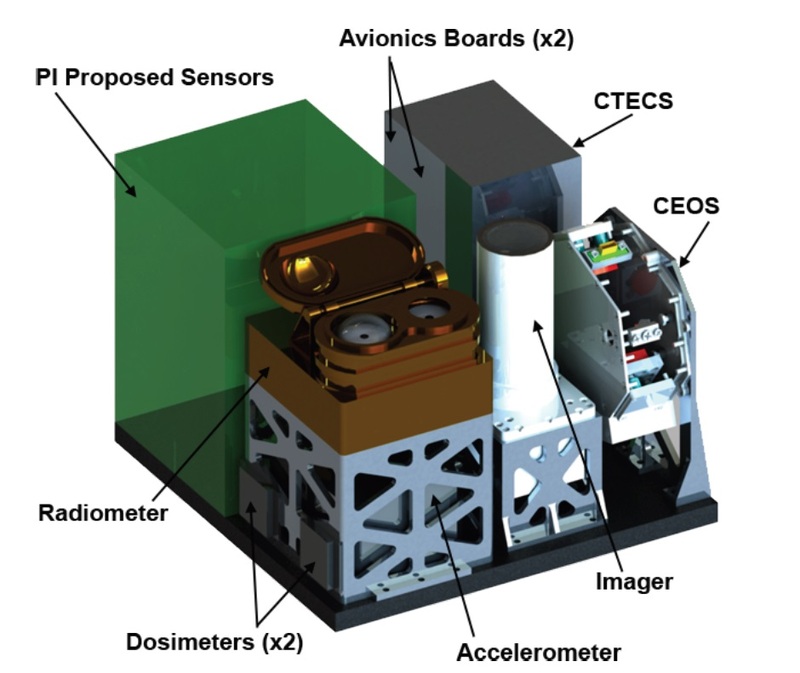 CEOS, the Compact Earth Observing Spectrometer, delivers spectrally resolved information on the outgoing shortwave radiation from Earth’s surface and atmosphere which is an integral part for the calibration of climate models. Spectral data generated by CEOS is also used for monitoring aerosols in the atmosphere and their effect in radiative heat transfer. CEOS hosts a compact Czerny-Turner spectrometer feeding a CCD detector array to provide spectral measurements from 200 to 2000 nanometers (ultraviolet-visible-near inforared) with a 1nm spectral resolution from 200 to 1000 nm and 3nm from 1000 to 2000 nm. The instrument’s foreoptics create a field of view of 1°, generating a 14-Kilometer ground resolution. The ultra-compact instrument finds heritage in the O/OREOS CubeSat flown in 2010 and the spectrometers flown on the LCROSS and LADEE lunar missions. 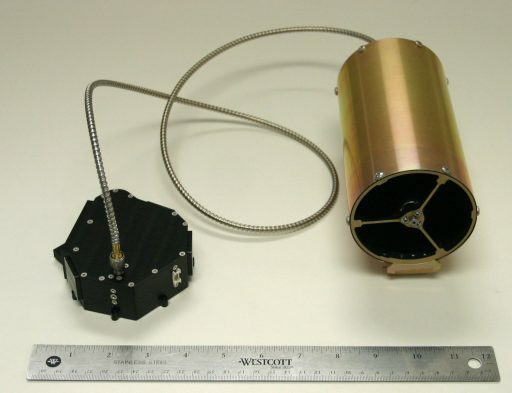 The Multispectral MicroCam Imager (MMI) is designed to capture multispectral images that can be assembled to one global snapshot every two hours when combining data from the entire Iridium constellation. 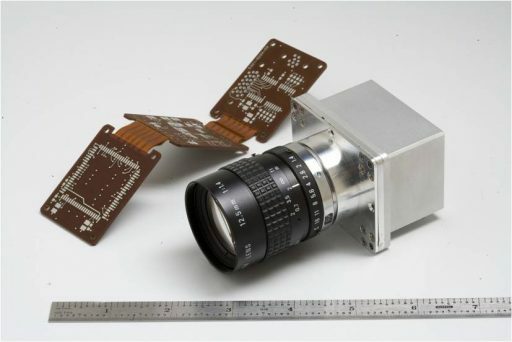 MMI is a visible-to-near-infrared wide-field-of-view imager using a STAR-1000 CMOS image sensor with 1024 x 1024 pixels. With a square field of view of 33°, MMI covers a footprint area of 465 x 465 Kilometers with images collected every 29 seconds to provide continuous imaging in the along-track direction of the satellite. The multispectral imaging ability of MMI is achieved by placing custom-designed strip filters in front of the detector oriented in the across-track direction to allow MMI to function in a pushbroom mode. 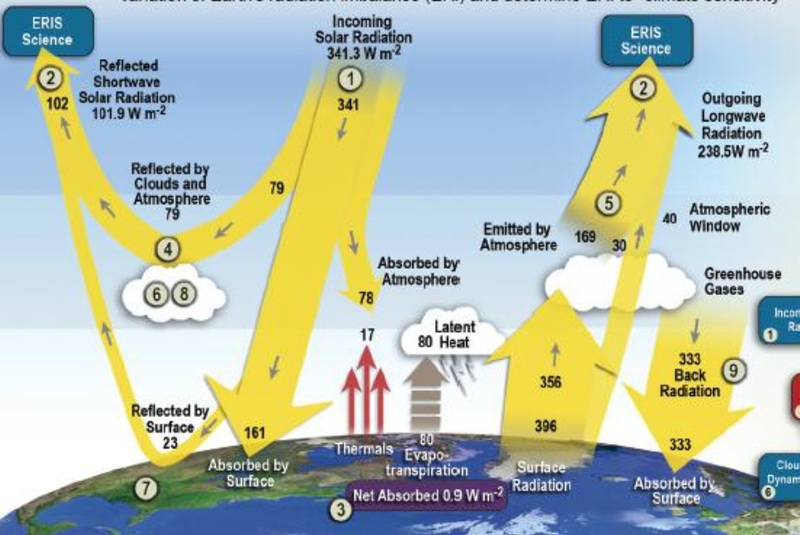 The Dosimeter-based RBMS (Radiation Belt Mapping System) studies dynamic processes ongoing in Earth’s radiation belts including relativistic electron bursts, particle loss to the atmosphere and geomagnetic cutoffs of solar energetic particles. A pair of Teledyne micro dosimeters is installed on each Iridium-NEXT satellite, one measures electrons at an energy resolution of 0.3 to 5 MeV and the other detects protons with an energy resolution of 10 to 50 MeV. RBMS can measure the dose rate attributed to galactic cosmic rays and the most intense particle events caused by solar energetic particles. MASS is the MEMS Accelerometer for Space Science and comprises a series of MEMS accelerometers for the measurement of the variations in Earth’s gravitational field as well as satellite drag for neutral density studies. MEMS (Micro-Electro-Mechanical Systems) gyroscopes are vibrating structure gyro systems featuring a silicon ring fixed to a structure in which vibration is induced using a small electric current. Lateral motion of the ring – caused by coriolis force – can be measured to deliver a signal proportional to the rate of motion along the sensitive axis. To measure rates along all three axes, the satellite combines several MEMS accelerometers. MASS offers unprecedented sensitivity to current accelerometers of similar size and power – ideal for gravimetric measurements. GEOScan offers a full constellation approach to answer outstanding questions in Earth science and space environment state variables. The use of the same sensors across the Iridium constellation provides homogeneity of observation – simplifying data analysis and reducing errors. The most important area of study for GEOScan is Earth’s Energy Imbalance which, to date, has never been conclusively measured on a global scale. GEOScan delivers global data with a temporal resolution between one and two hours and a spatial resolution between 450 meters for the imager and 500 Kilometers for the radiometer. This revolutionary coverage will enable scientists to show how highly spatially and temporally variable phenomena aggregate and contribute to global changes. The most central instrument for climatic studies conducted by GEOScan is the radiometer which, for the first time, can actually measure the Earth Radiation Imbalance which is the difference between the total incoming radiation from the sun and the Total Outgoing Radiation (the sum of reflected solar radiation and re-emitted longwave radiation). Climate models stipulate that the current climate change results from an imbalance of only 0.1 to 0.2% between incoming energy and Total Outgoing Radiation. Incoming solar radiation is known to within 0.03% using current spaceborne sensors, however, Total Outgoing Radiation has never been simultaneously sampled across the globe. Current models are no better than 1% and fail to resolve the imbalance predicted by climate models. GEOScan promises to measure outgoing radiation at the 0.1% accuracy level and also track local and seasonal variations. Gravitational measurements made by GEOScan open up access to a wealth of new information such as large-scale and short-term mass transport processes governing the global water cycle. 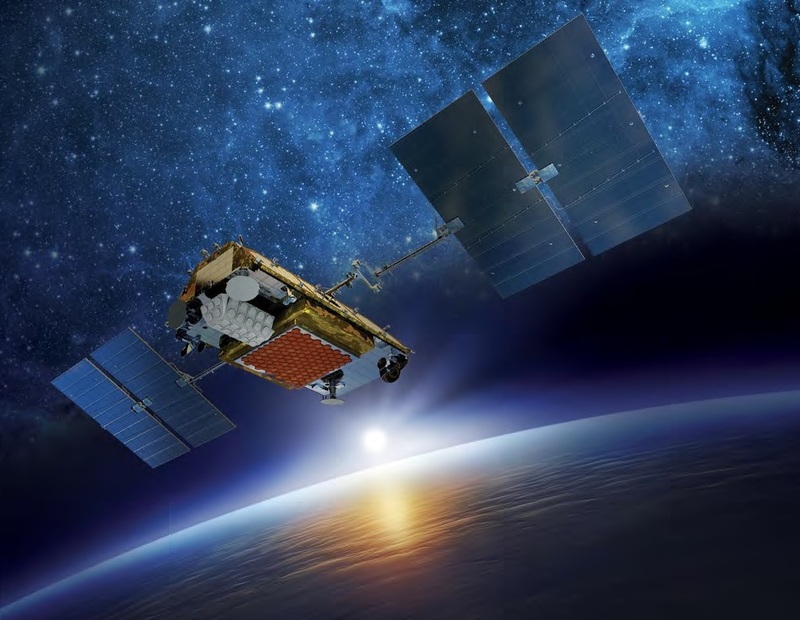 Previous gravity science missions only operated a small group of satellites whose orbits only repeated every few days; with Iridium’s GEOScan, full, continuous coverage is possible and can reveal changes these other missions may have missed. The measurement of even minute changes in Earth’s gravity is possible by combining several measurements made by GEOScan. The GPS receivers of the CTECS instrument are used to determine the satellite’s orbital trajectory with an accuracy down to one centimeter. Position measurements can be differentiated to create a time series of accelerations experienced by the satellite at the various positions in its orbit which represent both gravitational and non-gravitational forces. Accelerations by non-gravitational forces (solar pressure, atmospheric drag) are measured by the MASS gyros and can be subtracted to leave as final data product the accelerations caused by Earth’s gravity. GEOScan can not match the spatial resolution from previous gravity science missions such as GRACE, but its temporal coverage will permit the observation of high-frequency events lost in GRACE’s one-month time resolution. Global gravity data at a time resolution of one day has never been collected before and should be of great value to ocean and atmosphere scientists.